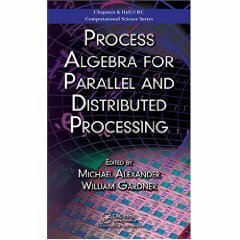 Finally, one of my last scientific works on BPM and the pi-calculus has been published as a book chapter in Process Algebra for Parallel and Distributed Processing, edited by Michael Alexander and William Gardner. The chapter itself is called Business Process Specification and Analysis. In contrast to prior work, it is written at a more sophisticated formal level (at least from my point of view), thanks to my co-author Uwe Nestmann. Indeed, I wished my doctoral thesis would be this formal. Technically, we investigated the asynchronous pi-calculus (new work here) and also introduced a formal or-join execution semantics for the pi-calculus (more new work, but not completely formalized). The main focus, however, was the introduction and discussion of Trios, a concept that refined the functional abstraction (definition 5.2 of my thesis). Concluding, I can recommend the paper to anyone (still) interested in using the pi-calculus in the area of BPM (what else should I say as an author :-). Unfortunately, I have no permission to provide a PDF file for download, so you have to either find a library or make a rather huge investment to get the chapter. But what I can offer for free is a prototypical tool that was developed during the writing of the chapter. While it's command line based (written in Ruby), it has a graphical representation of the business process currently executed. And yes, you need the same Mac tool (called OmniGraffle) as for the Lazy Soundness Toolchain to create your own BPDs that can be imported. But don't worry, I provide a lot of ready to use examples to showcase the execution and analysis of business processes in the asynchronous pi-calculus. The homepage of the tool, called pishell, can be found here. Have fun! I would also like to place a last comment (and thanks) to the editors and publishers of the book. In contrast to Springer (where you have to do all by yourself), the chapter was proof-read by experts and the grammar and spelling have been professionally checked. I'm giving my first public presentation this year at the OOP 2009 conference taking place next week in Munich. In contrast to the last years scientific talks, this will be my first industry (say commercial) talk. So, if you're around, I happily invite you to learn about the inubit way of practicing holistic business process management. I will guide you through the 45 minutes with a show case based on an HR process. Besides slides, I will also give a life demonstration. 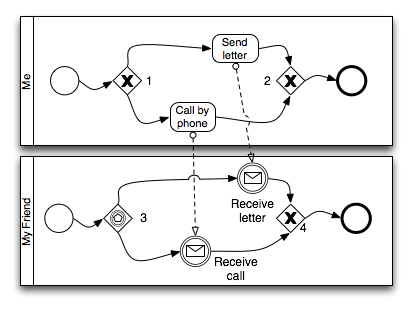 The shape of the Event-based gateway changed from BPMN 1.0 to BPMN 1.1. Both types of Gateways (Event-based or Exclusive) make a decision, i.e. only one of the outgoing Sequence Flows is taken. Only one of the Gateways, however, is used for joining Sequence Flows. That one is the Exclusive Gateway (please keep this in mind when modeling). 1. An Exclusive Gateway is always used when the decision is internally (up to you, based on locally available information). 2. An Event-based Gateway must be used when the decision is externally (up to others, based on distributed events). You could either choose to write a letter or make a phone call. The decision on how to get in touch is made in the Exclusive Gateway numbered with (1). Please note, that the decision on how to get in touch is completely up to you. The Sequence Flows are joined with Exclusive Gateway numbered with (2). 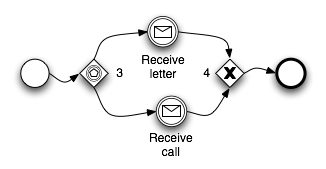 The decision is made in the Event-based Gateway (3), based on the directly following Event that is triggered first. The flows are joined, once again, by an Exclusive Gateway, in (4). It can be clearly seen that the decision is made in the upper Pool, whereas the lower Pool can only react to that decision. Now, hopefully, I will never see a BPD with a wrong use of the Event-based Gateway anymore (and I've seen way too much). 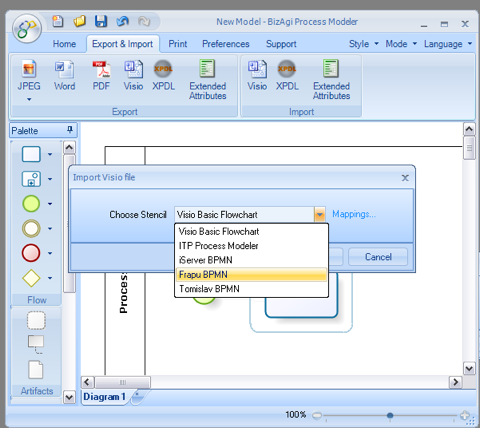 The BizAgi Process Modeler now sports an import option for Visio files using the BPMN 1.0 stencils that I offer here. Thanks to Matthias Weidlich for pointing me to this feature of BizAgi Process Modeler.